Description: Perennial aquatic or marsh grasses, stoloniferous or forming large floating masses; culms mostly prostrate. Sheaths flattened; ligule membranous, elongated, pointed, becoming divided with age; blade narrow, acuminate, flat, contracted at the base into the top of the sheath. Inflorescence a raceme or several racemes on a primary axis, peduncle much compressed, racemes with 1-few spikelets distant from each other; a bristle-like point produced beyond the uppermost spikelet. Spikelets shortly pedicellate, solitary, narrow, slightly dorsally compressed, closely appressed to the slightly zig-zag axis, falling entire from the pedicels; florets 2, the upper usually female, sometimes bisexual, the lower male. Glumes dissimilar, the lower minute, nerveless, the upper longer than the lemmas, 5–many-nerved. 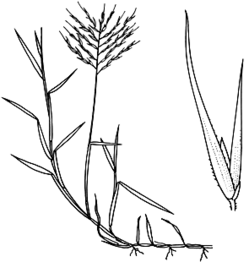 Lemmas not alike; lower similar in shape to the upper glume, but without hairs; fertile lemma much smaller, thin, translucent, nerveless. Lower palea c. 75% the length of its lemma, 2-nerved, the upper slightly shorter than the lemma, very thin, translucent, obscurely nerved. Distribution and occurrence: World: 7 species, India to Australia. Australia: 2 species (native), all mainland States.